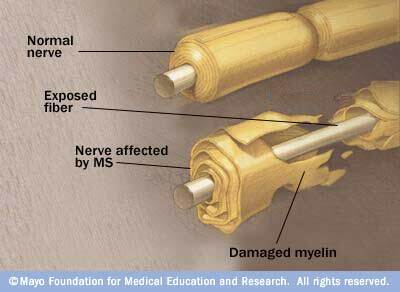 Multiple sclerosis (MS) is a disease in which the nerves of the central nervous system degenerate. Myelin, which provides a covering or insulation for nerves, improves the conduction of impulses along the nerves and also is important for maintaining the health of the nerves. In MS, inflammation causes the myelin to disappear. Consequently, the electrical impulses that travel along the nerves decelerate. In addition, the nerves themselves are damaged. As more and more nerves are affected, a person experiences a progressive interference with functions that are controlled by the nervous system such as vision, speech, walking, writing, and memory. About 350,000 people in the U.S. have multiple sclerosis. Usually, a person is diagnosed with multiple sclerosis between 20 and 50 years of age, but multiple sclerosis has been diagnosed in children and in the elderly. Women are twice as likely as men to be affected by multiple sclerosis earlier in life. How is MS being treated ? 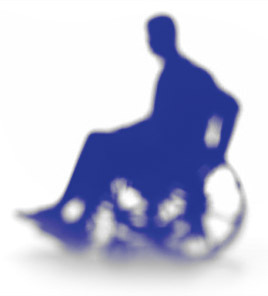 Patients with relapsing-remitting multiple sclerosis (RRMS) are often prescribed interferon (IFN) beta or glatiramer acetate as a first-line therapy. Those therapeutic agents have a good safety profile and are usually well tolerated by patients. There is also evidence of efficacy of those drugs through several clinical trials. However, the problem with those drugs is that patients have to inject themselves every day, and it is hence not very practical and triggers less compliance to treatment. New emerging therapies have been developed though, such as Natalizumab as well as Fingolimod. Those two agents are used when there is a poor response for the first-line therapies. They have been associated with a wide array of adverse events. The former for instance has been related to a few cases of PML (Progressive Multifocal Leukoencephalopathy). The latter has been correlated with a higher incidence of infections at the level of the respiratory tract, herpesvirus infections and increases in alanine aminotransferase. This is why those medications have to be prescribed with great caution, and risk management plans have to be established in order to evaluate which patients are most at risk to develop those complications or side effects. There is hence an increasing and unmet need for other therapeutic agents to be available.